Five performances curated by Randy Gibson and Megan Schubert, featuring some of the most talented interpreters in New York in works that highlight the influence of the performer on experimental music from the 20th century and today. This, our fifth year, was truly a milestone in our history, presenting new work by a truly iconic composer, our largest John Cage celebration to date, the newest work from one of the most notable up-and-coming composers, and Randy Gibson’s longest Apparitions… to date. The opening concert featured iconic vocalist Joan La Barbara performing a major new work, Palimpsest, by Alvin Lucier in the mold of his landmark I Am Sitting In A Room with an entrancing text by Lydia Davis. This evening-length World Premiere performance blended Lucier’s interest in resonance with a new take on his use of text, creating a wildly complex layering of speech that slowly dissolved into the sounds of the room, erasing comprehension and shifting the focus onto the sound of the voice itself. The anchoring event of the festival continued to celebrate the music of John Cage. An all-day performance of Variations IV kicked things off with over 30 performers coming and going according to the rules of the composition (which specifies only Where sounds are to take place), radio stations beamed in from around the world, a piano being delivered and tuned, and a simultaneous, unsynchronized reading of the classic Lecture On Nothing. The audience took part too: exploring the space, interacting with radios, microphones, and noisemakers, photographing the festivities, and becoming part of the composition. The day closed with the crystalline beauty of Cage’s final opera, Europera 5. This amazing work was performed with true passion by singers Megan Schubert and Adam Herskowitz, pianist Yegor Shevtsov, lighting designer Kryssy Wright, as well as Eric Hubel on Victrola, and noted sound designer Bob Bielecki performing the Truckera tape he helped create with Cage. This is a work filled with tiny moments of unexpected beauty and humor, an homage to all that is, and can be, an Opera. The jazz-inflected complexity of composer Alex Mincek came through on a concert featuring his long collaboration with percussionist Ian Antonio (Talujon) in a series of works that made use of the wide timbres possible with percussion and the rhythmic savvy of incredibly talented musicians. The evening closed with the World Premiere of a new Trio that Mincek had been contemplating for many years performed deftly by the composer, Antonio, and Greg Chudzik. 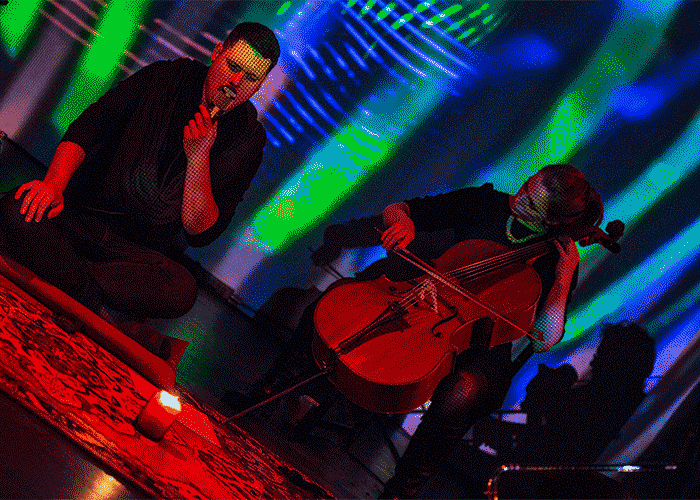 The festival closed with Randy Gibson’s ongoing tuning-driven Drone-Epic, Apparitions Of The Four Pillars…. The most complete and powerful version of the work to date featured Gibson intoning vocal melodies and drones along side the trombones of Jen Baker and Will Lang and the strings of Drew Blumberg, Erik Carlson, and Meaghan Burke. Over its three hour duration the audience was enveloped in a lush just intonation sound world, immersed in video and lighting by Oscar Henriquez Scott and Kryssy Wright, recalibrated to the glacial pace of the music.